January – Planning for the Unique Writing Workshops I run twice a year at Gunton Hall Coastal Village (April and November). Unique as I cover everything from getting started on your first writing project to publishing and marketing your finished work. These are interactive and fun-filled days – but you can pick and choose, come for any or all of the sessions. February – Began the month with a writing holiday to Tenerife. Author gig at Woodbridge Library in Suffolk. March – On Southwold radio. Author gig at a women’s literary festival in London. April – Author gig at Chelmsford Library in Essex. Ran my Unique Writing workshops and met some inspiring writers. May – Two author gigs this month in Suffolk, one at Kesgrave Library and one at Bury St Edmunds. June – Arranged an evening Beach read. Weather a bit blowy but everyone had fun. Author guests on blog were: Sandra Delf, Ellie Holmes and Tricia Cass. Ran a writing competition. Winning entries and those highly commended would be included in a published book and sold on Amazon. All royalties would go to Alzheimer’s Research UK. Cover change for Books 1 and 2 in my Chatty Cat series: ‘Chatty Cat: My Purr-fect New Home’ and ‘Chatty Cat: Spring into Summer’ (books for children and adults read them too). Designed by Rachel Lawston and I love them, hope you do too. July – I ran the 2nd East Anglian Festival of Culture (#Eafoc) at the Coconut Loft, Hatfield Hotel and The Clyffe Hotel. Author guest on my blog: Lynda Stacey. Book endorsed by children’s authors Terry Tarbox and Wendy Leighton-Porter. September – Author gig at a Lit Fest in London. I ran writing workshops at Woodbridge Library and met some inspiring writers, some who aim to publish their work. October – On Southwold Radio. Planning the writing workshops ready for next month. During the Autumn I had the wonderful opportunity of running writing enrichment sessions at the Ormiston Denes Academy. I worked with young inspiring writers and illustrators and have offered contracts to two young illustrators who will see their work in print very soon. Two individual books to raise money for Alzheimer’s Research UK. Thank you for your fabulous support in 2106 which was greatly appreciated. May this year, 2017, be a good one for you. I am a 67 year old wife, mother and grandmother, now retired after spending many years working with adults with learning disabilities. ‘No Going Back’ is totally fictional. It started in my mind as a short story when I attended a Creative Writing course at my local college. As the characters grew, the story evolved. It has a lovely cover. Did you have any say in what you wanted the cover to be? Thank-you. Yes, I knew roughly what I wanted and met with a local Artist who came up with the cover. I loved the colours and felt it was perfect for the context of the book. Look for writing groups / courses where you get advice and support. The local Library is a good place to get information. Believe in yourself and enjoy. I don’t actually have a routine as I write when the mood takes me. I can get lost in my writing so I try to clear anything pressing before I start. I like background noise when I write – it seems to help my concentration. I did most of my own editing for ‘No Going Back’ as it was my first book and I had no idea of how to go about things. I had invaluable help once I found out more about the process and I will use an Editor for my next book. The cost involved will be well worth it when I think of the blood sweat and tears I used up this time. I love getting lost in my work. I love discovering how my characters come to life and take me off track. I get excited when I’m nearing the end. I get frustrated when my ideas get blocked. I hate it when my brain won’t switch off when I’m trying to sleep. Yes – I will be at the East Anglian Festival of Culture (Eafoc) across the weekend of 2nd and 3rd July in Lowestoft (details below). I would love it if people stopped by to say hello so don’t be shy. So proud I can’t describe it – it’s a lifetime dream come true. I love all the positive feedback I’ve had. Thank you, Tricia. You have been a marvellous guest and I look forward to seeing you at the East Anglian Festival of Culture (EAFOC) this July in Lowestoft, Suffolk. I was born in Essex but made in Cornwall and use those two places as the source of inspiration for my writing. Like most people, I juggle commitments to family and friends, a part time job and my writing so my days tend to be hectic and my nights are long. I write under the pen name of Ellie Holmes which is a combination of my two grandmothers’ names. I decided to use a pen name because I also write darker, crime driven novels which I may publish under my own name in due course although I haven’t completely made up my mind about that yet. I might introduce a darker line of Ellie Holmes’ novels instead. My debut novel is called The Flower Seller and it is commercial romantic fiction. Believe it or not, it was supposed to be a short story about a woman re-entering the dating game after many years of marriage. One hundred thousand words later you can see my imagination took over. It developed into an exploration of the idea that people are not always how they first appear which is a rich seam for a writer to mine. Thank you, that’s very kind of you. Yes, absolutely. As an indie author the cover is so important. I chose the cover designer I wanted to work with – the wonderful Berni Stevens www.bernistevensdesign.com and wrote her a detailed brief. My brief included my wish for the cover to be “eye catching and beautiful with rich colours” and she certainly delivered on that. I love it and count myself very lucky to have such a beautiful cover. Do something writing related every day. Really it’s the only way. If you can carve out a few precious minutes each day you will be amazed by what you can achieve. But that doesn’t just mean writing. In addition to that it could be catching up on a webinar on an aspect of the writing business you need guidance on. It could be researching a topic for your next book. It could be choosing editors or cover designers if you are self-published. If you are engaged in the business of writing and serious about what you are doing and have the commitment and the strength of will to keep going for longer than a few weeks you are a writer. Being a writer is not about having a deal or not having a deal. It is not about traditional publishing or self-publishing. It is about the commitment. I aim to write 5,000 words a week, a 1,000 words a day for five days, usually in the evenings. In addition, I write two blog posts a week. The blogs I tend to write first thing in the morning. The one day a week I am at home (apart from weekends), I spend editing. I usually let a piece of work sit for a few weeks before I start editing. When I do, I’ll read it through making a few notes about the flow, any loose ends I haven’t tidied up and the areas that need expanding upon. Then I start the hard work of working through it chapter by chapter until each chapter sings. Once I reach the end of the beginning (usually around the thirty thousand word mark for a full length novel) I’ll do an out loud read through of that section. It helps to improve the flow and sharpens up the dialogue when you hear it out loud. Then I repeat the process for the middle section and the final section. Before doing an out loud read through of the whole thing. My read throughs for The Flower Seller were accompanied by the loud snoring of my longhaired Dachshund Sasha, hopefully my book won’t have the same soporific effect on humans!! I love the buzz when you have an idea and you start to develop it and suddenly the characters take over. When you are in the zone it’s almost as though you are taking dictation from them which is wonderful. I don’t enjoy writing the blurb for the back of a book. I am a hundred thousand word kind of girl (fifty thousand for my novellas) sticking to 150 odd words is HARD! Yes – I am going to be taking part in a pop up book shop at the East Anglian Festival of Culture across the weekend of 2nd and 3rd July in Lowestoft (details below). I would love it if people stopped by to say hello so don’t be shy. When I first held my book it was a bittersweet feeling. My mum had very much been looking forward to sharing the moment with me but she died earlier this year. My dad is also gone and I know he wanted this for me perhaps even more than I wanted it for myself. Then, as I remembered all the hard work that had gone into not just writing the book but creating it, I felt very proud. Thank you, Ellie. You have been a marvellous guest and I look forward to seeing you at the East Anglian Festival of Culture (EAFOC) this July in Kirkley, Suffolk. My debut crime fiction novel is being released under the name J.M Hewitt. I’ve had two novels published previously in my own name, both contemporary fiction, and this is my first venture into the world of crime. I would have to think back very far to answer that one, I recall writing a short story about a woman soldier when I was about eleven years old. I always remembered it and I’ve revamped it recently and entered it into the Flashbang Flash Fiction competition for Crimefest 2016. I remember quite clearly declaring at ten years old that I was going to write a book and for me, it seemed a natural progressive move from reading. I’ve had many inspirations over the years, Ffyona Campbell (the first woman to walk around the world) and her books detailing her travels always stuck with me. She’s a strong woman, and after she completed her trans-world walk she went off the grid for many, many years. I always felt so desolate that this woman would never know that she was my inspiration, and my second novel, Worlds Apart, was written with Ffyona in mind as the main character. Imagine my delight when a few years ago she reappeared in Devon, having spent years living with the Aborigines and was now back in the UK, ready to teach all her findings. She runs wild food walks now, and we have interacted many times since she came back. One of these days I’m going to accompany her on a walk. And to walk side by side with your own hero, that’s rather a mind blowing thought! Alex Marwood was the one who led me into the world of Crime Fiction, with the debut novel The Wicked Girls. I have met her several times and count her as a valued friend. Ruth Dugdall, fellow Suffolk author, is also so supportive. And these lovely people, they branch off into other friendships and introductions, often I can’t believe that the genre we write in houses such wonderful folk. Firstly I love to teach with my work. It’s my own personal opinion but I always think if you can read a book and learn a little something then you take away so much more than you ever expected. This train of thought probably comes from how I was taught. One of my earliest memories is of my parents teaching me from their own history books, this was before I even went to school! So that method is probably engrained within me. I was only eight years old when the nuclear disaster happened, but it has always intrigued me greatly – a place on earth where nobody can go? It led me to thinking, what about if people didn’t leave; what if a bunch of them stayed and something terrifying was happening but because it’s a no-go area no law enforcements would help them… I must say I’ve absolutely loved the research that I needed to do in order to do this book justice. It’s so interesting, the parallels between man-made disaster, science, the reclamation of nature and government cover ups. I’m still researching now as I’m going to be doing several talks about it this summer and every time I delve into it I discover something new. It falls in the genre of crime fiction, with a little bit of history thrown in. Yes, I always kind of knew that the Chernobyl book would be the first in a series. I’m currently a third of the way through the sequel and this time, its set in Schevenigen, Holland. Many of the characters from Exclusion Zone will make an appearance in book two. Never, ever give up. My line of thought is this: you can never get worse, your writing will only improve with time and experience and there is no age limit in this choice of career, unlike if you wanted to be, say, a model. I took part in a workshop last year and some people were saying that if this opportunity didn’t lead to anything they were going to give up! I was horrified, sure, the rejection can be tough, but rejection is everywhere in life. Take it, learn from it and keep going! Also, interact with writers. There are many events which cost next to nothing or are even free; talks, book signings etc. Yes, I belong to a lovely group called the Felixstowe Scribblers. They are a mighty fine, supportive bunch of people. We meet twice a month and we have homework to do, usually 1000 word pieces but sometimes flash fiction. I’m so thankful for this homework, creating short stories takes me out of my comfort zone, which is a good thing! My mum is usually my first reader and she’s honest too, which is what you need. 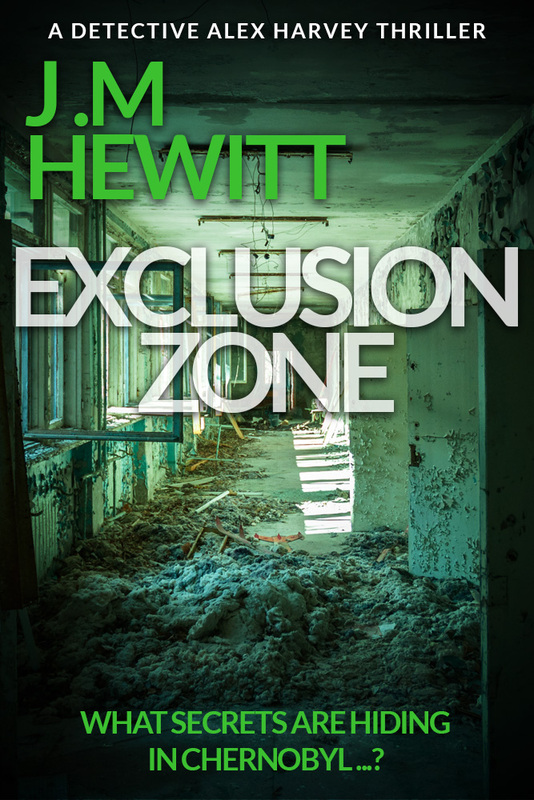 I’ve got a couple of critique offers for the next book I’m planning, but the making of Exclusion Zone moved so fast there was no time. However, I’ve had an unbelievable amount of support from fellow authors and bookish friends. They will certainly be acknowledged; in fact I think my acknowledgement section on Exclusion Zone is at least a page long. It’s like a weepy Oscar winning speech! I write by hand during the week and then type it all up on a Saturday. If I’ve finished typing it up I’ll continue on with the story through to Sunday. Any spare moment is spent writing, that includes train and plane journeys, holidays and evenings. With writing longhand and then typing it up its almost editing right there, as I can see what’s not working the second time I go through it. I try to write blocks of words at a time, maybe going back chapter by chapter to pick up any errors that slipped through the net. The creation – of people’s lives (and deaths!) is a good feeling of power! Of course, the characters go off on their own paths and sometimes I have to follow them and see where they lead me; I’m not totally in control. I really don’t think there are any points I least like, I truly love every part of the process, especially research. To be a published author has been my dream for around thirty years, so when people tell me they’ve read it and they liked it that’s great. When they say they learned something that they didn’t know that’s even better! If anybody does fancy finding out a little more about Chernobyl or my work I’m in the process of arranging lots more events throughout 2016, so do keep an eye on my website. I’ll also be a ‘guest curator’ on BritCrime in April. BritCrime is a fantastic free online festival made up of many crime fiction authors that usually runs in the summer. Do check them out on Twitter: @BritCrime and on Facebook: BritCrime Authors.